Today I'm continuing my Cup of Bead Soup with ceramic beads from Spirited Earth. This is a bit of a long one, so grab a cup of something lovely (tea, coffee ... soup?) and stay for a while. The first necklace is made using a technique I first debuted with my Bonsai necklace in the Creative Jewelry 2010 magazine. 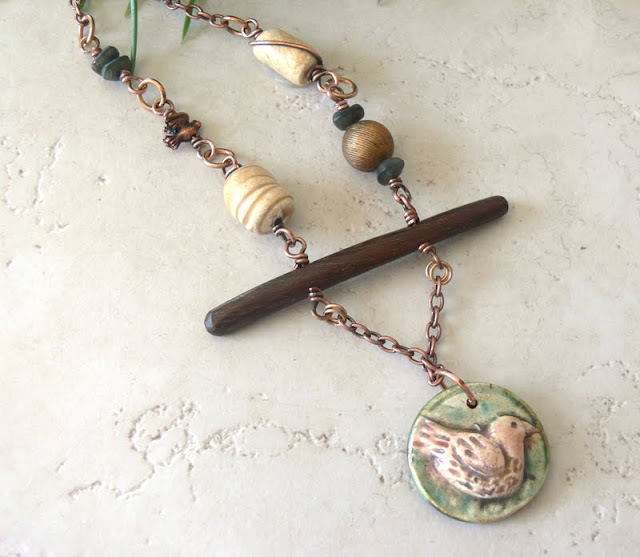 The gorgeous bird pendant from Spirited Earth dangles from copper chain beneath a wooden twig. I then used two more of Nan's ceramic beads (wrapping one in copper wire), a vintage copper bead, some matte green glass, and a tiny little copper bird. To keep the necklace light and airy, I left the top portion bare of beads. The second necklace I'm quite proud of because when I first saw the pendant, I had no idea how I was going to do it justice. It's very pale, with a delicate wash of color that I was afraid of overwhelming. For a long time I pondered over what beads I could use -- should I stick with ceramic in the same natural tone or use dark brown cording? What about all silver, perhaps a unique chain? And then it hit me one night while I battled insomnia -- why not play up that blush of persimmon pink? After that, the rest fell into place with rapid speed. Padparadsha and olivine Swarovski crystals, used in moderation, picked up the hints of salmon pink and olive green in the ceramic pendant. Branches were on my mind from the last necklace, so I chose a silver branch, punching an extra hole in it for an asymmetric bead dangle. Natural wood matched the color palette of the pendant, and I found some lotus blossom findings in a back drawer that only needed some holes drilled in them to make the perfect links. During my recent weekend retreat with Cindy Wimmer, I learned her trademark bead wrap technique and decided to try it with the 8mm crystals. I'm still working out the kinks and haven't gotten it down perfectly, but I like how things turned out! (Thanks, Cindy!) I oxidized things, buffed it, and there you have it! My last piece is my do-over piece. Once again, I had a night of insomnia, and this necklace crept into my mind. What did I do wrong? 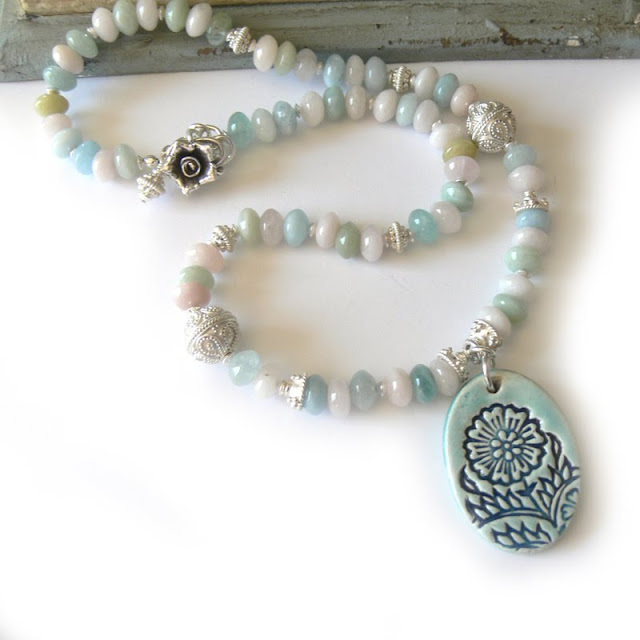 Well, for one thing, the elegance of the aquamarine and bright silver just didn't go with the earthiness of the pendant. It all felt off-kilter. I knew as soon as I had the chance I was going to have to take this apart and start from square one. As I finally drifted off to sleep, it hit me -- sodalite and amazonite. Of course! Don't you think this is SO much better? Once again, I used Cindy's wire wrap technique, oxidized and buffed the wire (oh wow that takes a long time!) and then sat back to admire the finished necklace. I'm very, very pleased with this one and hope it finds a happy, loving home! So there you have it. Three Cups of Soup (and one that had to get reheated). What did I learn? One, I shouldn't underestimate myself. I didn't think I'd be able to tackle pendant #2 but I feel I did it justice. Two, I shouldn't be afraid to start over. I'm the owner, designer, and chief bottle washer of this business, so *I* get to say when something is finished. And lastly, I should embrace new tools and techniques, even if I've previously never used the tool or considered the technique too time-consuming. I've had three different metal punches languishing in my tool box begging to be used, and now that I made myself use one, I feel more comfortable reaching for it. 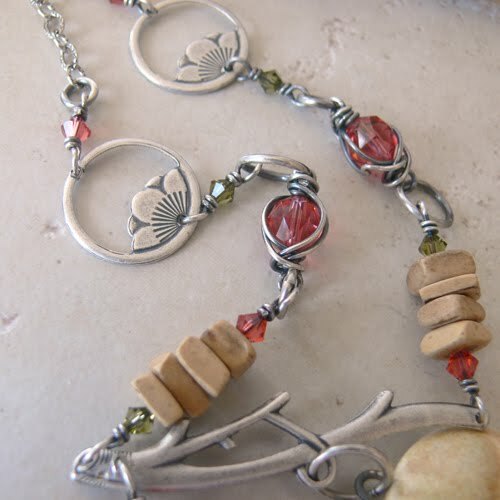 I love the way oxidized silver looks, but have avoided it because the finishing is so time-consuming. That mindset just isn't conducive to spreading my creative wings. And I want to fly. 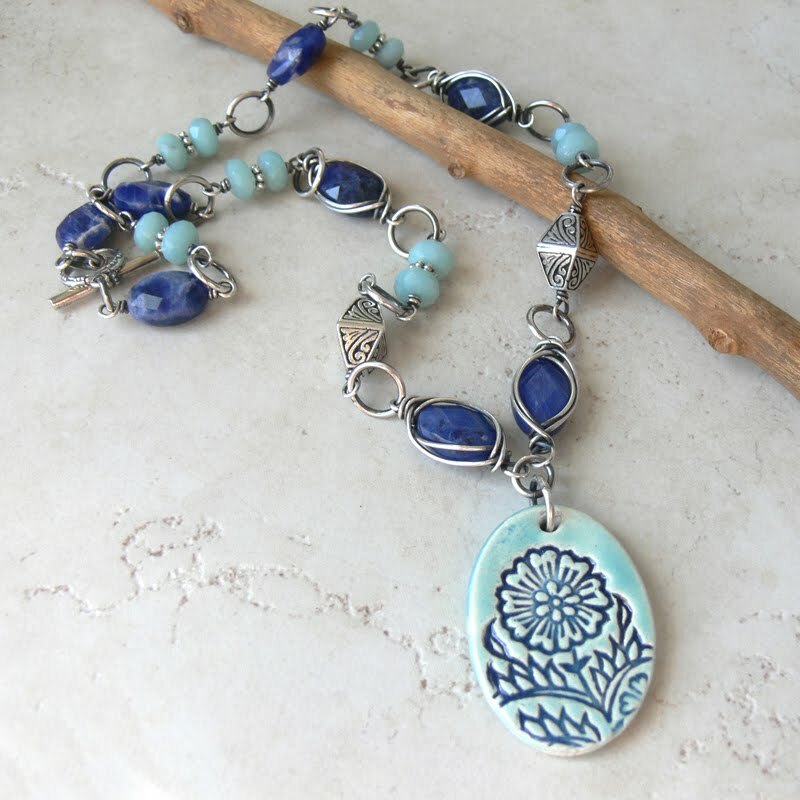 A big thanks to Nan Emmett of Spirited Earth for her ceramic pendants and beads, and also to Cindy Wimmer of Sweet Bead Studio for teaching me the wire technique! I think you've pulled off this challenge exceptionally well! They're all fantastic pieces, but the do-over... THE BEST!! I do love the darker blue necklace better! Great pieces! You absolutely knocked that one out of the park! the Blue re-Do is my favorite..the bolder colored stones really set off the focal. i am laughing about the disc being so challenging..it looks wonderful too..
Lori, I am just so amazed. Wow is right! All three necklaces are gorgeous..and full of wire which I just love. You really nailed it with the silver branch necklace and Nan's focal. What a great idea to play up that pink shade with the olivine. And your redo just jumps off the page, it is so pretty!!! I wouldn't be surprised if it already found a new home! Great work and the do-over is wonderful. I really love the stretching and trying new techniques best of all. I love all three of them, but especially the do-over of the blue! I literally gasped when I scrolled down to it! Blues are my favorites, and these colors just really popped! Great job! 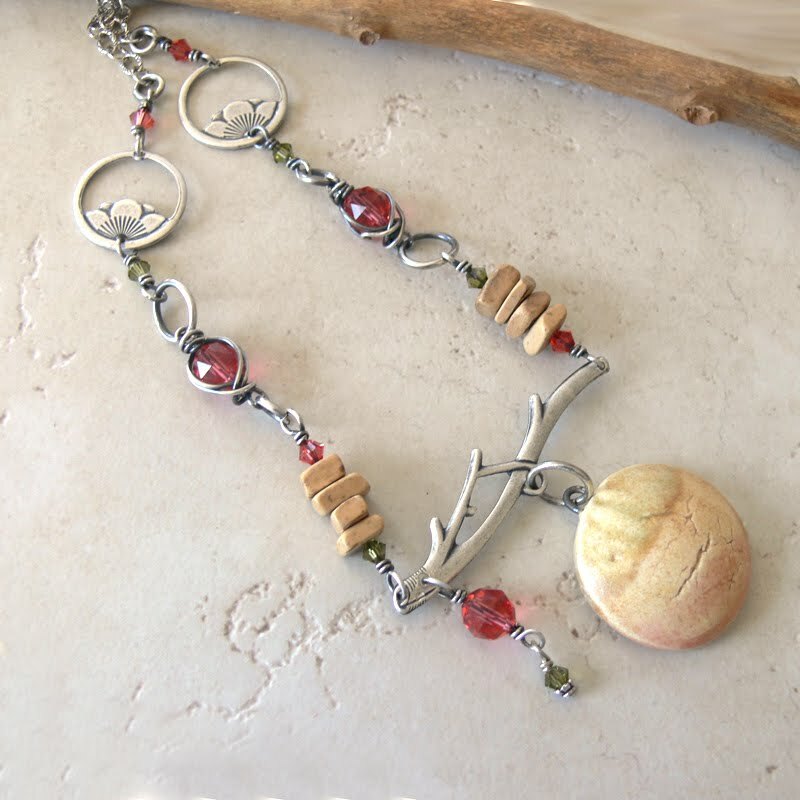 I love the wire wrapping of the beads - awesome! I really love how your do-over necklace turned out; way to start over, though it is a pain it was well worth it! You really.....OMG no words to describe the beauty of your work! Not only have you chosen great artists to work with you really do their pieces proud! I am so lucky to be inspired by you! Yes, all of them are beautiful! I like the way you used the crystals in a subtle, less-is-better way! Nice wrapping, now we all want to know HOW!! Your re-do piece made me think right away, where's the dark blue? Well, you popped it right out, you'd better make some similar ones so there's no wrangling! Keep creating! Wow - those are great -you are really stretching yourself. I esecially loved the make over one -that came out fantastic. Glad you went with your instincts. I love that wire wrap you learned from Cindy. I wish she would teach that or do a video or something on it. Lori - love them all - but really love the blue re do - it's beautiful!!! I love all of your jewelry in this post!! Especially the do-over!! It's great to know that I'm NOT the only one out here thinking something is off kilter and then end up with a beautiful do-over! I like your lessons - we need to be mindful of them. I REALLY like the middle necklace..It reminds me of cherry blossoms. You nailed the colors on this one! You knocked creativity out of the park on all these designs, Lori! Kudos on speading your wings. These are all beautiful. I really like the versatility that having a metal punch provided you. I may have to get me one of those - can't tell you how many times I've had some component or other and thought "this would be perfect if only it had an extra hole HERE." I absolutely love that new wirewrap technique. Need to find a tutorial on it. Oh wow - beautiful!! The color combinations are fabulous... I would never have those of putting the sodalite and the amazonite together...may I use this combination sometime? I have a really hard time using the bright blues of lapis or sodalite - I have a ton of amazonite (it's my favorite)it works so well together!! Those pieces are just wonderful especially the dark blue one! Thank You so much for the kind words : ). Love-Love-Love each of these. I love the way you describe it "feels" wrong - my friends have laughed at me for that one ! How can it feel wrong ????? It just does - I totally get it! Love the wire work and yes I too have been avoiding my silver oxidising-it does however look stunning when done. My heart belongs to the first one and it's sweet bird pendant !!! I don't think you should ever even *consider* underestimating yourself! Every one of these pieces is amazing. I'm especially drawn to the first couple, with their perfectly combined colors and their balance. Those are three light but hearty cups of soup. I love the changes you made to the third and thank you for sharing that. It is so helpful to see before and after design changes. You are right, don't be afraid to start over. I will take that advice and run with it!! What a magnificient makeover! Loving all the colors and techniques. Great work as always! Lori, these necklace are spectacular. Imaginative, colorful and full of visual interest! I must say, the do over was very well done. The final result was fantastic! I have enjoyed watching your blog.